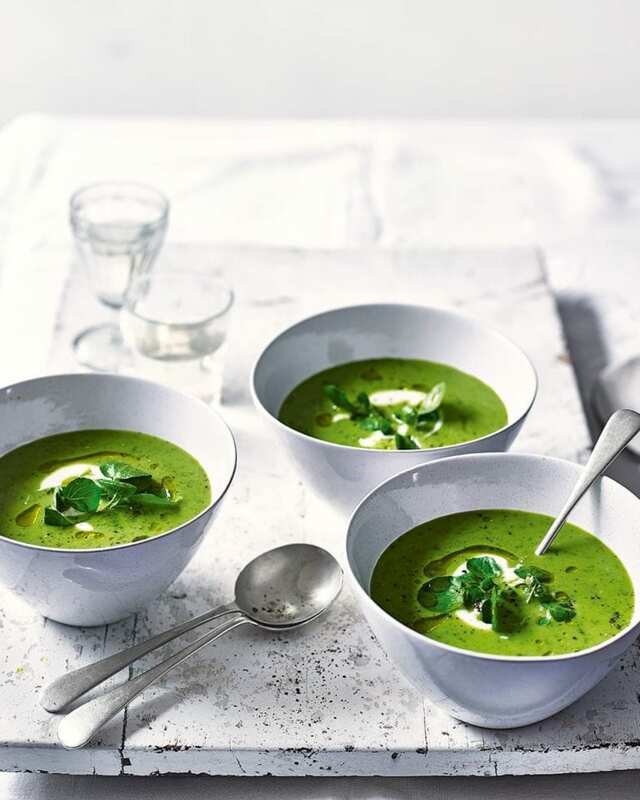 Delicately fresh and sweet, this chilled pea soup is a summer stunner. It’s cheap to make too as it uses frozen petit pois. Heat a glug of oil in a large saucepan over a medium heat. Add the spring onions and cook for 8 minutes, then add the garlic and cook for 2 minutes more. Stir in the peas, then pour over the hot stock, season with salt and pepper and simmer for 5 minutes. Meanwhile, roughly chop most of the basil and most of the salad leaves. After the soup has been cooking for 5 minutes, add the chopped leaves to the pan. Bring back to a simmer and cook for a further 2 minutes. Remove from the heat and, using a stick blender, whizz until smooth. Stir in most of the yogurt, then put in an airtight container and chill for at least 4 hours (see Make Ahead). Once chilled, season to taste and divide among 4 bowls. Top with the remaining yogurt, basil, salad leaves and a drizzle of olive oil to serve. Make it at least 4 hours in advance (to allow time to chill), or make the day before and keep covered in the fridge. Leftovers will keep for 2-3 days, covered in the fridge.